Battling a persistent headwind throughout the day, fillies by Danza, Fast Anna and Twirling Candy worked quarters in :21-flat to share honors for the fastest work at the distance at the opening session of the under-tack show for the Ocala Breeders' Sales Co.'s 2019 Spring Sale of 2-Year-Olds in Training. Following are the three fillies to tie for the day's fastest time for a quarter-mile over the Ocala Training Center's all-weather Safetrack surface. Hip No. 109, a bay filly by Twirling Candy consigned by de Meric Sales, agent, is out of Henley, by Corinthian, a half sister to graded stakes winner Mr. Commons. Hip No. 115, consigned by Envision Equine, agent, is a bay filly by Fast Anna out of graded stakes-placed Hermione's Magic, by Forest Wildcat, and is a half sister to stakes placed Tizanillusion. Hip No. 167, Irish Danzing, a chestnut filly by Danza consigned by Wavertree Stables, Inc. (Ciaran Dunne), agent, is a half sister to stakes placed Irish Heroine out of stakes placed Irish Ridge, by Cactus Ridge. Four horses shared honors for the session's fastest eighth, stopping the timer in :10-flat. Hip No. 6, consigned by Hartley/De Renzo Thoroughbreds LLC, agent, is a bay filly by Shanghai Bobby out of stakes winner Fast Resource, by Bob and John, from the family of OBS graduate and leading sire Into Mischief. Hip No. 31, a dark bay or brown colt by Tapizar consigned by Off the Hook LLC, agent, is out of Franchesca, by Henrythenavigator, a half sister to stakes winner Abbey Bridge. Hip No. 129, also consigned by Hartley/De Renzo Thoroughbreds LLC, is a dark bay or brown filly by Daredevil, a half sister to champion Judy the Beauty out of stakes winner Holy Blitz, by Holy Bull. Hip No. 198, consigned by Whitman Sales LLC, agent, is a bay colt by Bodemeister out of Just Fabulous, by Include, and is a half brother to graded stakes placed Midnight On Oconee. 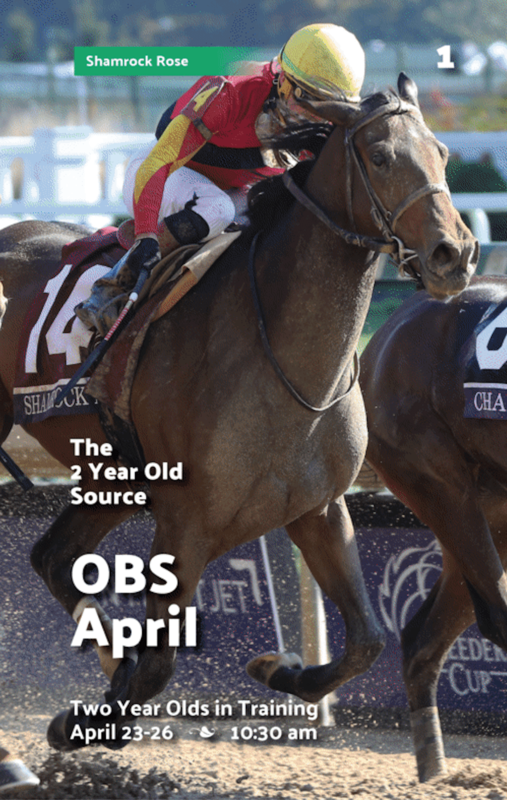 The OBS Spring under-tack show continues at 8 a.m. on Tuesday, April 16, with Hip No's 204 – 406 scheduled to breeze. To view the full results from Monday's under-tack show, click here. This entry was posted in Bloodstock and tagged Bodemeister, breeze shows, danza, daredevil, de Meric Sales, Envision Equine, fast anna, Fast Resource, Franchesca, hartley/de renzo thoroughbreds, Henley, Hermoine's Magic, Holy Blitz, horse auctions, Horse Racing, Irish Danzing, Irish Ridge, Just Fabulous, obs april sale, OBS Sping Sale, Ocala Breeders' Sales Co., Ocala Breeders' Sales Co. Spring 2-year-olds in training sale, Off the Hook, shanghai bobby, tapizar, Twirling Candy, Under Tack Shows, wavertree stables, Whitman Sales by Edited Press Release. Bookmark the permalink.